According to a report from Goldman Sachs released earlier this year, construction will be the biggest commercial sector for drone use in the near future. We saw a similar trend when we examined DroneDeploy user data in our Commercial Drone Industry Trends report — construction was the fastest-growing industry for drone use. For many, this trend isn’t a surprise. Current commercial and prosumer drones can easily fly the area of a typical construction site and provide timely and high-resolution maps and 3D models of site progress — offering significant efficiency gains compared to traditional methods. Although there’s been a lot of talk about why drones are a great fit for construction, there are relatively few real-life examples being shared about how construction companies are actually using drones on the job site. That’s why we’re excited to bring you this story from Brasfield & Gorrie, one of the largest privately held construction firms in the United States, about just one of the many ways they’re using drones — to generate an elevation map of a hospital construction site and compare it to design elevations in order to confirm earthwork activities. Brasfield & Gorrie began exploring the use of drones for inspection several years ago, but when new FAA regulations were released, wanting to ensure full compliance, they ceased operations until gaining their commercial section 333 exemption in December 2015. Today, drone operations are housed in the Virtual Design and Construction (VDC) group, a 24-person team dedicated to improving construction processes through the use of Building Information Modeling. The team is equipped with the DJI Inspire series at each of their regional offices. 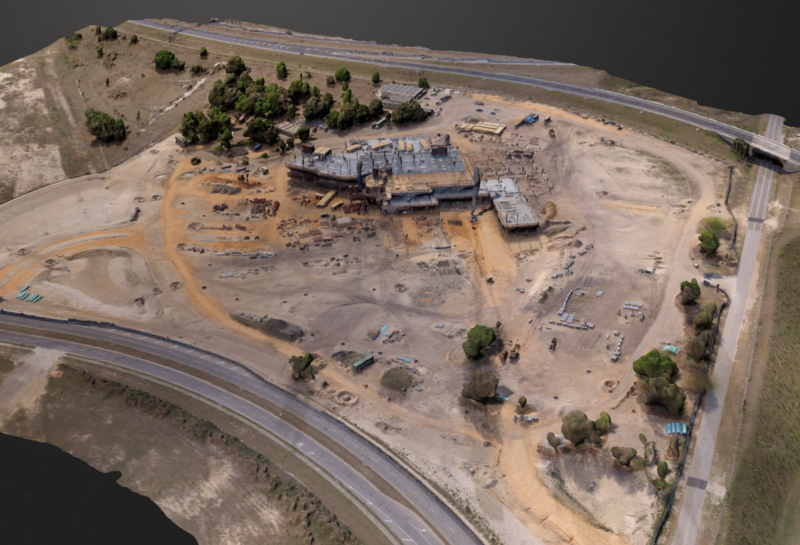 Whether capturing aerial photos or video, or generating detailed 3D models of entire sites through the use of photogrammetry, drones enable them to rapidly gather information during all phases of construction in a safe, economical, and practical way. During the course of work on a 61-acre hospital construction site in Florida, the VDC group received a request from field operations. A subcontractor had just finished initial earthwork, but the site manager was concerned that the earthwork did not yet match what had been designed. He enlisted the help of the VDC group to verify what work had been done. To learn more about this project, we heard from VDC coordinator Jesse Creech and field engineer Charles Curtis. “We were tasked to figure out the difference between the current overall site grade and the proposed finish grade,” said Charles Curtis, a field engineer on the site. The size of the site made it a great candidate for drone mapping, since measuring the elevations of the earthworks using traditional methods would have been a very expensive and time-consuming process. The VDC group contracted with a local drone services provider, Dronebase, to fly the site and provide the licensed pilot required. Dronebase flew a Phantom 3 pro and used the DroneDeploy mobile app to plan and automate the flight. Due to the size of the site, multiple flights were needed. Total flight set-up and execution took about an hour. 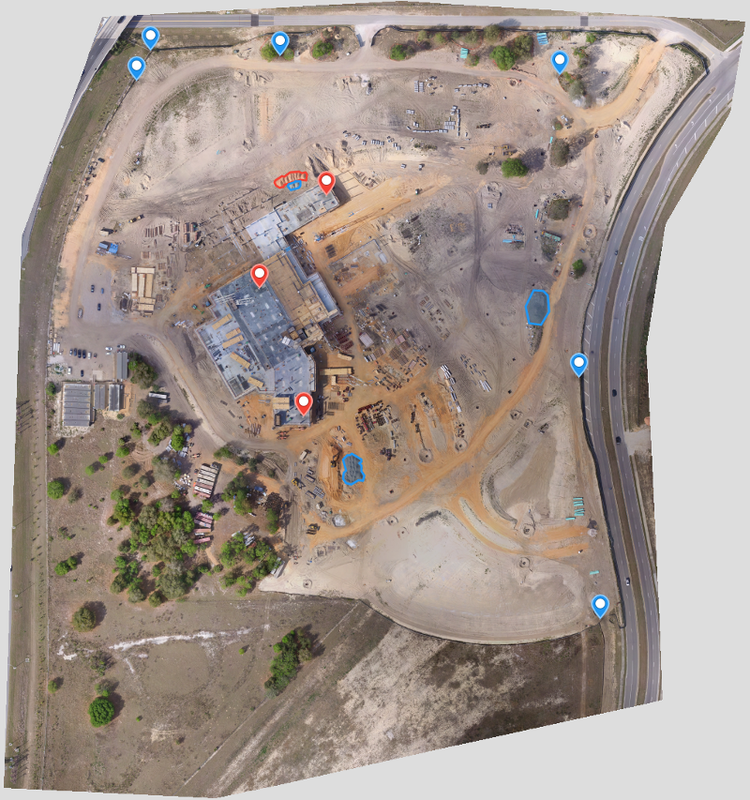 After flying the site, Brasfield & Gorrie uploaded the captured imagery to DroneDeploy. Later that day, DroneDeploy’s cloud platform had finished processing the imagery into an orthomosaic map, elevation map and 3D model. Once he received the completed map in DroneDeploy, the next step was for Jesse to get the elevation data from the drone flight into a format in which it could be compared to the existing site plans. This meant that the model had to be projected in the same local coordinate system that the design file used, and had to achieve a high degree of accuracy (i.e., a geographical point in space had to appear in the same place on both models). Once the two models were properly aligned, Jesse could then compare the model of the existing site with the design file. 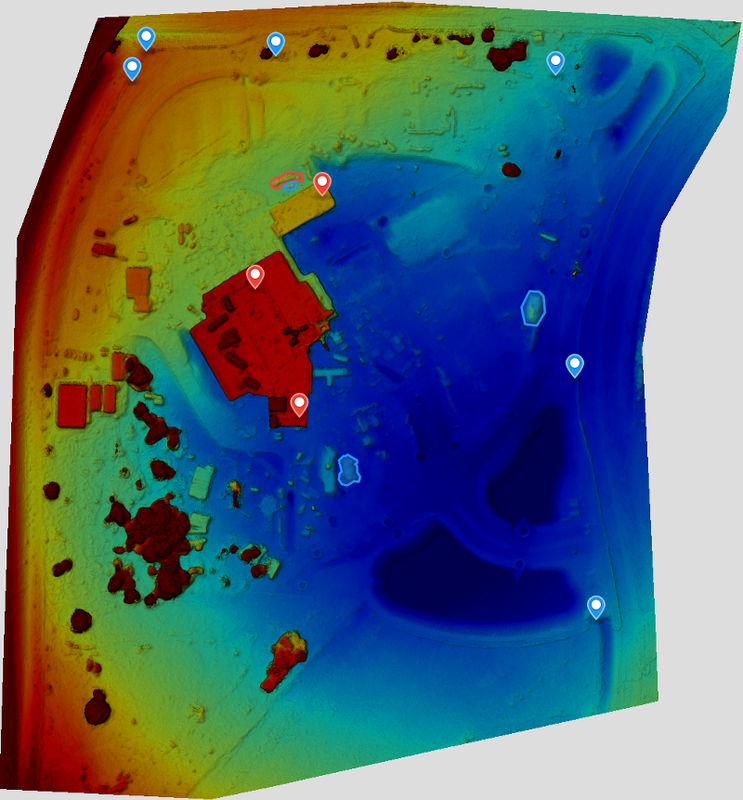 The final output was a heat map showing the external contractor’s earthwork progress according to plan. Green indicated areas where actual elevations matched the design plans. Areas in blue were too low, while areas in red were too higher relative to plans. From Jesse’s heat map, it was clear to see the progress the grading contractor had completed to date. Using a drone to map the area allowed the VDC team to assess earthwork on the site much more quickly than they could have done using traditional methods, while also providing a higher degree of detail. According to Charles, the field engineer, completing the same project with traditional methods would have required over 1,000 survey shots. Even though 1,000 shots sounds like a lot, the drone easily captures many, many more data points that result in a much more detailed model of the site’s elevation. “These minimum 1,000 shots would not have taken into account spoil piles or trenches, so in order to maintain accuracy, we would have had to follow the contours of all extraneous features, significantly adding to the amount of shots,” said Charles. On the data analysis side, the time required was comparable to other methods, but Charles is confident that the process will become much more efficient over time. “We learned a lot with this process and I feel that in the future, we can increase the accuracy and drastically reduce the time to process and analyze the data,” he said. Overall, the project demonstrated the massive time and cost savings that drone mapping is bringing to Brasfield & Gorrie. “The speed with which a drone flyover can capture highly detailed imagery is the time saver. Overall, I feel that utilizing the drone, we spent a third or less of what it would have taken to do the job manually,” said Charles. Jesse summed it up another way. Plan your mission first. No two construction sites are the same, and neither are the hazards involved. The worst thing you can do is arrive to a site without a predetermined flight plan. Establish your goals. Know what you want to do with the data before you collect it, since this will determine the level of detail needed for mission success. Ensure FAA compliance. Be willing to deny services if unsafe or uncompliant operation is being asked of your organization. Enlist the help of real pilots. UAS flight overlaps with actual aviation. Brasfield & Gorrie enlisted the support of a licensed pilot in order to establish operational use of drones. Research before buying a UAS. Be alert and agile, as the technology is changing rapidly. The features mentioned in this post are available as part of DroneDeploy’s customer plans, which start at $99 per month. Learn more about our paid subscription plans or start your free trial today. Interested in sharing your story about how drones are bringing value to your business? We’d love to hear from you and feature you on our blog. Email [email protected] to get in touch.